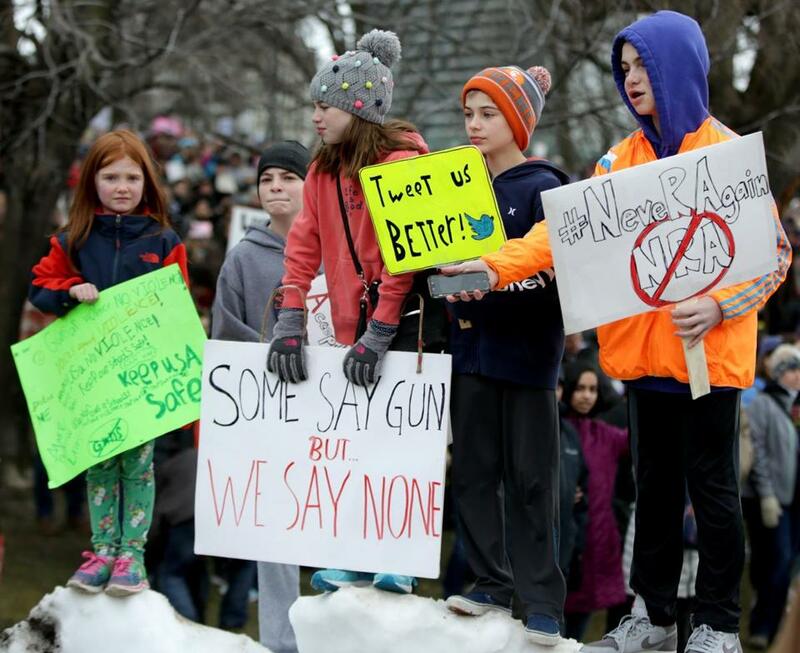 Youth want gun control; will the candidates listen? Charlotte Diana, Sam Newman, Rachel Newman, Ben Newman, and Luke Andrews participate in the March for Our Lives on Boston Common last March. The student-led March for Our Lives succeeded because its leaders channeled the anguish and pain of a mass shooting into real action — pushing millions to march in the streets and call for an end to gun violence. And as Americans, we responded. Youth voter participation increased by 10 percentage points in the 2018 midterm elections, as compared to the 2014 baseline. Dozens of NRA-backed members of Congress lost their seats. Over 40 companies announced they would stop doing business with the gun lobby. Sixty-seven gun control bills were passed throughout the nation, and even 14 Republican governors signed new measures to strengthen their current laws. Public opinion kept up with this progress. Sixty-eight percent of young people told pollsters last summer that they saw school shootings as the most important issue facing the country, leading one researcher to describe the issue of gun violence as “this generation’s 9/11.” Students supported familiar gun violence prevention policies like universal background checks, but an overwhelming majority also favored bolder proposals — ideas you’re less likely to hear about on the road to the 2020 election. Eighty-one percent of young people polled for SocialSphere backed increasing funding for urban gun violence. Seventy-nine percent believed a gun license should be issued and renewed like a driver’s license. Seventy-three percent supported voluntary buy-back programs. Meanwhile, as the presidential campaign season gears up, contenders have developed an appetite for big, bold goals. They’re calling for universal health care, an end to Washington corruption, and action on climate change with a Green New Deal. But that presidential ambition doesn’t extend to guns. The women and men vying for the highest office still regurgitate NRA talking points or push for incremental policy reforms that feel like we’re living in a time warp. During a town hall in Iowa last month, Kamala Harris spoke of being “in favor of the Second Amendment.” Amy Klobuchar mentioned enacting universal background checks. Elizabeth Warren and Cory Booker emphasized “common-sense gun reforms,” referring to the Clinton-era policy. To be clear: Expanding background checks to every gun purchase is an essential policy. But by focusing on individual initiatives without establishing a broad long-term goal, candidates are already bargaining against themselves. They wouldn’t dare do this on other issues, so why adopt this losing strategy on guns? Nobody, for instance, is campaigning on keeping some abortion clinics open; candidates talk about protecting everyone’s right to choose. They don’t run on helping the middle class do a little better; they focus on creating more jobs and expanding economic opportunity. Every politician will tell you women deserve equal pay for equal work; trying to argue for simply narrowing the gender pay gap will get you laughed out of the room. If March for Our Lives taught us anything, it’s that Americans are craving leaders who can establish a clear and bold long-term goal for significantly reducing gun deaths. That goal should be building a future with fewer guns. The United States has more than 393 million guns in civilian hands — more firearms than people — and researchers have found that easy access to guns is the best predictor for gun deaths. Where there are more guns, there are more gun deaths. Once you limit gun availability and create an environment where guns are significantly harder to get, gun deaths drop. Building that future won’t be easy, however, and lawmakers will have to meet that goal using a variety of “fewer guns” policies. Luckily, Massachusetts may offer some answers. To buy a gun, residents visit a local police department, get their pictures taken, get fingerprinted and interviewed, pass a gun-safety course, and go through a comprehensive background check. Police in Massachusetts also use a defined “suitability” standard that allows officers to deny licenses to individuals who pose a threat to public safety. The state consistently reports the lowest firearm homicide rates in the country. Presidential candidates will be looking for bold ideas they can own. Building a future with fewer guns should be first on their list. Doing so meets Americans where they are and honors the year that was so defined by the March for Our Lives movement. Igor Volsky is the author of Guns Down: How To Defeat The NRA And Build A Safer Future With Fewer Guns, due out from the New Press this April.